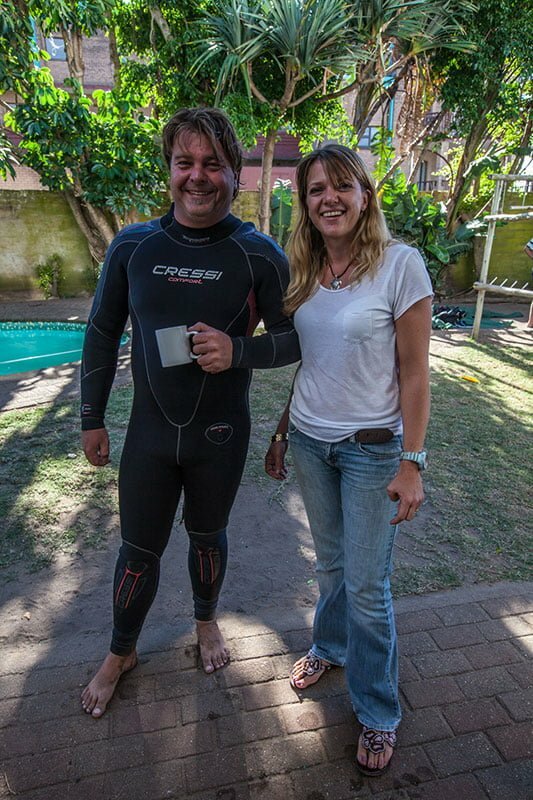 Started in 2009 ScubaXcursion is owned and run by Nicho and Maaike who have prided themselves on being a family friendly dive centre making it a great place for dive holidays for the whole family. ScubaXcursion are based at the Cutty Sark Hotel situated right on the main beach of Scottburgh, amidst 14 acres of beautifully manicured grounds surrounded by lush indigenous vegetation. Ideally located for all scuba diving enthusiasts, simply park your car, kit up in the comfort of the dive centre and stroll down to one of the most popular sheltered bathing beaches in South Africa, perfectly positioned right in the middle of the Aliwal Shoal Marine Protected Area, rated as one of the top ten dive sites in the world. The beach with its terraced lawn is geared for holiday fun for the whole family, simply laze in the sun on the beautiful beach or enjoy the tidal pool and supertube. For accommodation you can stay on site at the Cutty Sark Hotel. Centrally located Scottburgh offers wonderful activities for all age groups, from visits to the nearby CrocWorld, leisurely hours spent on one of the many surrounding golf courses and adventure sports activities at Oribi Gorge, you are assured of enough activities to keep divers and non diving family members entertained. 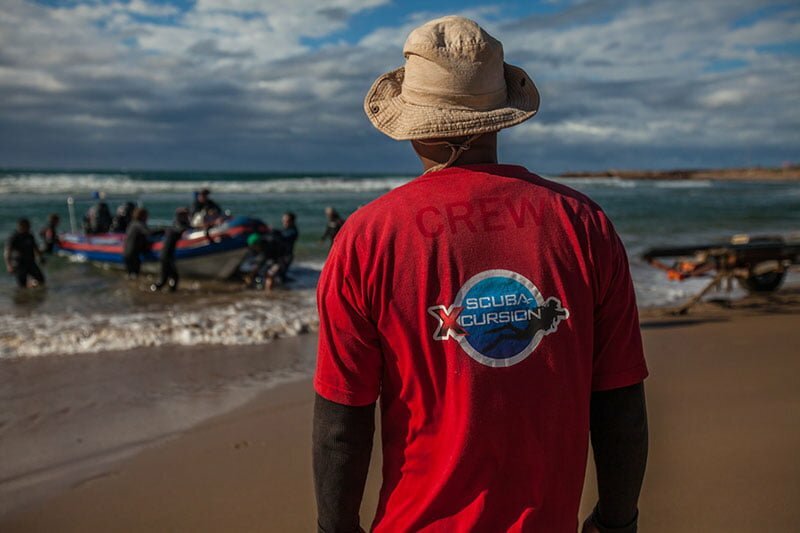 When diving with ScubaXcursion, the adventure starts with your boat ride off Scottburgh beach. Enjoy breath taking encounters with humpback whales, dolphins and off course during the months of November through to February, Whale Sharks, so make sure to take your snorkel on the boat for that once in a lifetime experiene to free-dive with these majestic giants. Once on back line you have the option of heading North to any of Aliwal Shoals amazing reefs or Wrecks, or you can go South to explore the untouched Southern reefs. The Southern reefs consist of mostly advanced dive sites and have a great selection of Coral and marine plants. Descend to a colourful welcome in shades of pink and purple with branched black coral trees, untouched whip coral twirling towards the sun and large green coral trees decorated wth goldies and other colourful reef fish, makes this dive a spectacular and colourful experience. The Southern reefs have structures that invite you to explore with indescribable swim throughs, canyons and crevices to explore its an aquatic playground. Aliwal Shoal is often rated by seasoned divers as one of their best diving experiences. The swirling mass of marine life and game fish found throughout Aliwal Shoal brings in the predators like few other reefs. It’s not uncommon to have encounters with Ragged Tooth Sharks, Oceanic Bllack tip Sharks, Zambezi’s and off course Tiger Sharks during our summer seasons. No words can truly describe or justify the life changing encounters that Aliwal Shoal have to offer, you simply have to come and experience it for yourself.